Mr. Trump keeps stumbling over the zeitgeist too; in some ways, he is the zeitgeist. Once, in the Oval Office, he met President Barack Obama, and afterward said, “He’s a very, very good man,” apparently convinced at last that Mr. Obama was neither Muslim nor Kenyan. According to informed sources, Mr. Trump did not drop his drawers. At least not then. The joke of Forrest Gump, of course, was that this dim but fundamentally decent man was present during so many moments when American history was being made. The joke of Mr. Trump is that this dim but fundamentally indecent man is present during so many moments when the America we have known is being unmade. The two men have another thing in common too. Forrest Gump, one day, decides to “go for a little run.” He runs from coast to coast, gradually amassing a crowd of followers. Reporters want to know what his motivation is — is he running for world peace? For women’s rights? For the environment? For animals? For nuclear arms? Mr. Trump, after descending a golden escalator, went for a little run too — for president. Why was he running, reporters wanted to know? Did he really want to be the nation’s chief executive, or was it just a stunt? “I wanted to do this for myself,” he said. As with Gump, no one could believe that somebody would do all that running for no particular reason. Now he’s stuck in a job that, according to at least some sources, he never really wanted in the first place. Goddamn, son. Life is like a box full of subpoenas. You never know when you’ll get one. 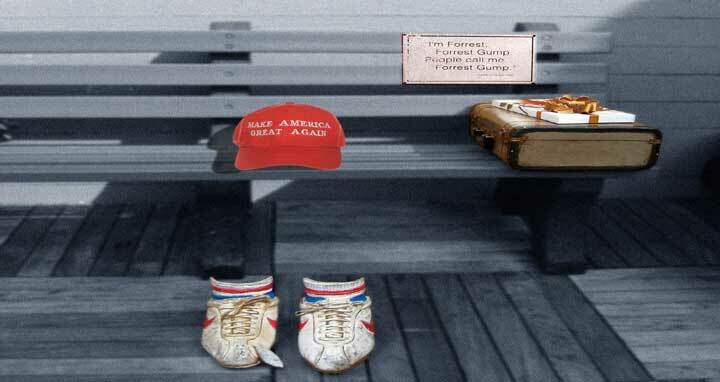 It’s the very absence of evil, in the form of loyalty, and truthfulness, and decency, that makes Gump who he is. Without these, all that’s left is his so-called stupidity. And if the Trump presidency has proved anything, it’s that there’s all kinds of stupid. It is a good word. You could use it to describe Forrest Gump, whose I.Q. of 75 did not prevent him from expressing loyalty and openheartedness. But you could use it to describe Mr. Trump as well: a man whose alleged smartness has somehow still not enabled him to bring us anything resembling decency, or justice, or economic equality, or love for one another. I know which one I’d choose. Stupid is as stupid does.